Old-fashioned pendulum clocks are powered by masses that need to be wound back to the top of the clock about once a week to counteract energy lost due to friction and to the chimes. One particular clock has three masses: 4.0 kg, 4.0 kg, and 6.0 kg. They can drop 1.3 meters. How much energy does the clock use in a week? This is College Physic Answers with Shaun Dychko. 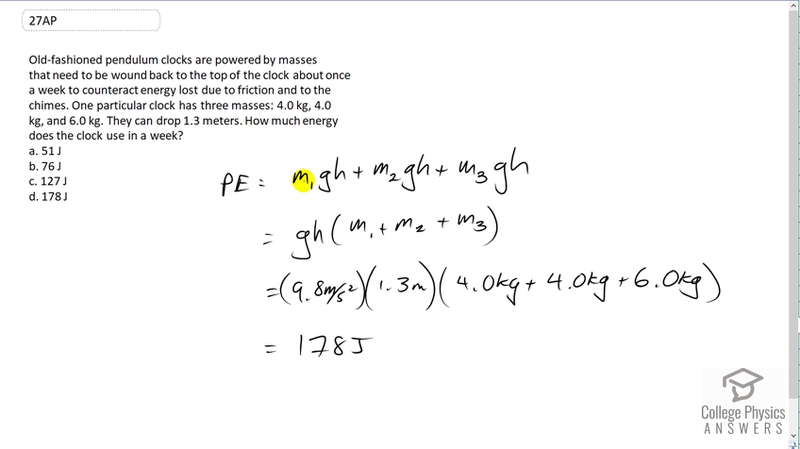 The total energy used by the clock will be the total potential energy change of each of the three masses. So we have m one times g h plus m two times g h plus mass three times g h and g h is a common factor that we can factor out. So we take the sum of the masses times g h to get our answer. So that's 9.8 times 1.3 meters that it drops, times four plus four plus six kilograms of all the three masses. That gives 178 joules which is answer D.